All you need is a gummy shark and a knife (poor sharky!) 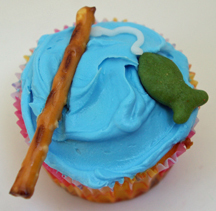 to make this simple shark cupcake for an ocean-themed party, aquarium visit, or other event. 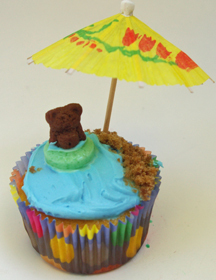 What You Need: 1 cupcake; white, off-white, or light blue frosting; 1 gummy shark; knife or kitchen shears. How to Make It: Frost cupcake. Carefully cut the shark slightly above its tail fin. 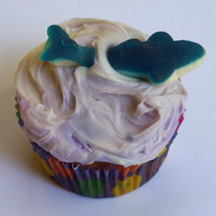 Place the tail and the rest of the shark’s body a short ways apart on the cupcake, so it looks like his midsection is underwater. 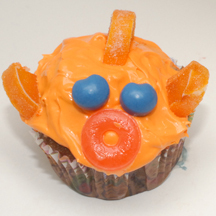 It’s the first ever “guest cupcakes” post on EasyCupcakes.com! 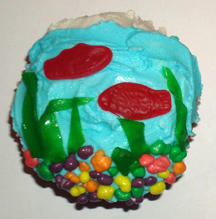 Emily K. and her kids had a blast making and decorating these fishbowl-themed cupcakes. Thanks for sharing them, Emily! What You Need: 1 cupcake; white frosting; frosting tinted blue; gummi fish (Swedish fish); Nerds candies; green fruit rolls; scissors or butter knife. How to Make It: Frost cupcake with a thin layer of white icing. Let dry for a bit. Frost all but about a half-inch area at the top of the cupcake with blue icing so it looks like water in a bowl. Put a bunch of colorful Nerds candies near the bottom of the “bowl” for gravel. Cut fruit roll into long pieces like aquarium plants, folding some over at the top. Add your fish! Is there a Finding Nemo fan in your house? Planning a themed birthday party? 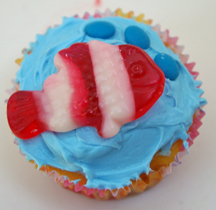 How much simpler can it get than plopping a gummy clown fish on a cupcake and adding a few mini M&M “bubbles”? What You Need: 1 cupcake; icing tinted light blue; gummy clownfish; blue mini M&Ms. How to Make It: Frost cupcake. Add fish. Add 3 blue mini M&Ms, upside-down so the writing doesn’t show, for bubbles.